Though I haven’t been in every theater in St. Louis, I’ve had a lot of time in the last 5+ years I’ve been living here to soak up the cinema offerings. I thought it might be nice to do an overview of the venues around the city and with some helpful information and colorful personal commentary that might be of interest to newcomers and long-haulers alike. There will be plenty of subjective bias in my ratings and critiques, but I’m trying to make the coverage rather expansive; including art house screens, megaplexes, college programs and novelty theaters. Not that anybody goes to theaters any more, if statistics can be trusted. A great deal of time and energy was spent by my college professors and today’s modern film theorists to explain why travelling to a community setting and seeing original film stock is still vitally important to maintaining a healthy culture, but American aggregate skepticism is still on the rise. Big screen HD TVs with surround sound systems are luring cinephiles back to their couches, while noisy crowds, endless condescending previews (now with outright commercials), uncompetitive ticket costs, post-apocalyptic food-shortage snack prices and downright lackluster selection has driven audiences away from theaters. And even I have to admit that I’d usually rather sprawl out in my cosy living room and watch a DVD with nominal market clout than subject myself to what increasingly feels like intentional indignities perpetrated by the callous theatrical distribution system. But sometimes I rouse myself for something worthwhile, rare or at least likely to spur enlistments from like-minded friends, and you know what? I still end up enjoying just about any trip to the silver screen. So here’s my St. Louis Theater Guide. Take it or leave it. The Moolah is a relatively recent addition, run by Cinema St. Louis in a converted Shriner’s temple. The towering outer façade is designed around baroque freemason architecture (somewhere between beautiful and gaudy) and is well-matched by the polished, handsome interior. The atrium is clean, classy and bright, but inevitably crowded and its popularity has forced the management to adopt an awkward color-coded ticket system for admitting the audience in phases. Off to the side of the main entranceway are an upscale bar (you can take drinks into the theater) and a lounge with seating and a billiards table. The screening room itself is advertised as “St. Louis’s largest living room” due to its popular section of overstuffed armchairs with plenty of leg room, arm room and accommodations for food and drinks. The size, comfort and novelty factor make this one of the more impressive experiences for film viewing that harkens back to the days of classical Hollywood movie palaces. The Moolah’s biggest shortcomings are the inconsistent choices for its single screen and the huge crowds that make early arrival a must and restroom trips a must-not. Cinema St. Louis’s other luxury theater is built into the ground floor of the historic Chase Park Plaza hotel with a winding and spacious entranceway that one can almost get lost in. The hotel’s bar and café provide a nice compliment to the movie-going experience, though food isn’t available particularly late. Other dining and night out options are easy since the hotel is situated in the well-developed Central West End and is a short walk from Forest Park. Despite the prime location and some of the smallest projection spaces in St. Louis, the five screens rarely have seating problems. Other advantages include free monitored parking across the street, excellent sound systems, hand-painted wall art, an old-fashion silent movie organ and gentle classical music (I can’t stand the looping pop-music used to create a sound floor in most theaters). The film selection generally features big-name indies and well-reviewed works (it’s currently showing the five Oscar nominees for best picture), with the trailers restrained to a minimum and targeting a moderately discerning audience. The odd man out in the trinity of St. Louis Cinema’s theaters is the Galleria 6 cineplex located in the Galleria mall. The Galleria itself is a midline mall with a variety of small shops and big chains, leaning more towards the latter. There are plenty of large semi-nice restaurants and an expansive food court that screams “land is not a premium” with its sprawling and usually sparsely-populated eating and resting areas (perfect for meeting up with companions). The theater is squished off to the side of the food court and has an underlit dungeon feel, not particularly improved by the general griminess and obnoxious advertising displays. Both the employees and clientele are on the very young side, with the film selection catering to that audience and generally not straying far from successful genre fare. The single-screen Hi-Pointe Theatre is St. Louis’s oldest (note the old-timey spelling) and shares mini-landmark status with the enormous “Amoco” sign across the street (which has been preserved despite the gas station changing to a BP). It has the dubious of honor of standing at the corner of one of the worst five-way intersections ever designed and provides almost zero parking (I suggest following Skinker Blvd a block behind the building). The theater used to be owned by Landmark and would show interesting and often risky indie and foreign pictures, but it recently closed for several months and was reborn with new, more mainstream, proprietors. There have been several waves of remodeling, but the atrium and roomy seating still maintain their classical, vintage charm. The staff has a reputation as film-savvy hipsters and provides some of the friendliest theater service around. A regular feature is the custom (often pun-based) taglines that appear on the marquee. 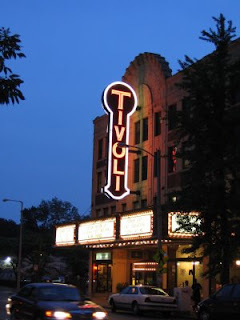 The Tivoli Theater is a prominent fixture of the Delmar Loop, St. Louis’s college cultural center and one of the most popular strips in the city due to its variety of independent stores (Vintage Vinyl being a top recommendation), coffee shops and Thai cuisine (like personal favorite Thai Pizza Café). The Tivoli has three screens: two smaller galleries on either side and an opulent primary screen known for its decorative flourishes and special events. The interior design of the foyer and concession area gives off exactly the right atmosphere, with vintage movie posters along the walls, evolving memorabilia displays and an intimate waiting area with small café tables. The staff is clearly dedicated, with familiar faces staying on over the years, a regular brochure on upcoming features and a key position at the heart of the St. Louis film festival. Celebrity guests, director Q&As and packed midnight screenings of cult films are not infrequent. The selection of movies tends to be interesting and varied, with quick turnover and relevant news clipping and essays displayed around the box office. Parking is inadequate and the traffic heavy on Fridays and Saturdays, but taking a stroll from a distant sidestreet is rarely unpleasant. Since the Tivoli was in walking distance of my university, I used visit it especially often and I have many fond memories. Landmark’s largest St. Louis venue is the six-screen theater at the north end of the Plaza Frontenac Mall. The extremely upscale shopping district possesses few stores where any visitor not chauffeured in their Rolls Royce would reasonably spend money, but it can make for pleasant window shopping. There is no food court or quick and cheap meal options even in the surrounding area, but there are several fancy restaurants nearby and a variety of wines, coffees and mixed drinks are served along with the usual concessions. Wooden furniture on the second floor provides an eating and waiting area, but be sure to note that the only restroom is partway downstairs across the thoroughfare from the theater. The screening rooms are relatively small, the acoustics only average and the chairs uncomfortable, as I’ve often noted during film festival marathon sessions, but it’s still better than average for a mall location. The place where the Plaza Frontenac really excels is the film lineup, showcasing the greatest number of critically lauded recent works in the area. The moderate crowds are made up of polite enthusiastic cinephiles and quiet upper-class retirees, since there isn’t much besides wealthy suburbs in the vicinity. In addition to being a fantastic art museum, SLAM also had an exciting film retrospective series that focused on classic and experimental films not available on DVD. These series usually revolved around a specific auteur (Jacques Rivette and Roberto Rossellini being particularly memorable) or tied into a temporary exhibit elsewhere in the museum. Informative speakers and detailed pamphlets provide context. Another favorite highlight was live musical accompaniment for silent films. The theater is tucked behind the museum proper, with plenty of parking above a nice view of the zoo and park. There is lots of seating inside the auditorium (clearly designed to serve for multiple types of events) and the ticket prices are low. The only drawback (and the main reason for my point deductions) is the rarity of screenings. I’m sure the issue is financial, but this is a case where I’d be happy to pay more taxes. The film program is currently offline completely, purportedly while renovations are underway, but it is sorely missed and without it there are few sterling repertoire options available in St. Louis. The premier film series in St. Louis is undeniably the Webster Film Series, a popular program sponsored by Webster University that features an eclectic mix of retrospective and new releases. The series exudes a genuinely independent vibe, with truly alternative films (documentaries are a specialty) often accompanied by introductions, Q&As and workshops with the filmmakers. Their well-organized calendars give you three months warning to plan your attendance and include capsule reviews to help with the obscure titles. The auditorium is built in a former chapel. The grand gothic architecture remains, but the pews have thankfully been converted into slightly more accommodating seating (there is still lots of room to improve in terms of comfort). Finding the building can be rather difficult for first-timers (look for the circle drive with international flags) and street parking is usually required (you may have a long walk during popular showings), but much of the audience is made up of Webster students who can simply walk on over. Best of all, the prices are cheap: $5-6 compared to the STL std. of ~$8. My only serious complaint is that sometimes the managers change up the schedule on short notice without updating the website. Still, if you have only one non-DVD resource for cinema in St. Louis, the Webster Film Series should be it. Actually part of the Webster Film Series (see above), Strange Brew is an addendum sponsored by Schlafly’s Bottleworks and geared specifically towards cult films. The Schlafly’s premises include a restaurant, gift shop and the brewery itself where visitors can take scheduled tours. They show a movie on the first Wednesday of every month in the back room where they have a bar and dining area. You can settle into the heavy wood furniture and get food and drinks while you watch. Tickets are cheap ($4) although the edibles are a bit pricy. Still, if you’re fond of heavy Northern dishes like venison chili and beer bread, this is your place. The small room (~40 seats) can fill up rather quickly, especially with popular films, but the programmers do an admirable job picking eccentric enough options that the niche audience is usually the right size. Projection is done on a small screen, usually from DVD, but occasionally on film stock. Titles include sci-fi B-movies (“The Incredible Shrinking Man”), cult documentaries (“Endless Summer”), blaxploitation (“Watermelon Man”) and offbeat comedies (“Bob Roberts”). While it isn’t up to Webster’s high standard, my alma mater also tries to foster a thriving cinema culture and an excellent film series. Screenings, still open to the public, are held almost every weeknight in Brown 101 but financial reasons have caused the university to cease publicizing the schedule (excessive groundskeeping, overpriced lecturers and semesterly concerts remain subsidized, however). The titles tend to be old and frequently tilt towards academic and art house interests, but many are rare opportunities to see essential and exotic films not available on DVD. The short intros typically provided by the professors are welcome, but sometimes it can take far too long before the films get underway. Limitations on the equipment mean that there are also occasional breakdowns and poor sound quality, but at least the screen is large. The seating capacity is also enormous, but the chairs are cramped and designed with awkward little fold-away desks. A balcony level (and I don’t just mean an elevated platform like at the megaplex) provides a great view. First-timers (and second-timers) should bring a campus map to find the underground parking or street meters and to navigate to the otherwise unmarked building. The St. Louis Science Center is an iconic bit of St. Louis architecture (the Obata-designed hyperboloid planetarium in particular) and family-friendly tourist location. The center includes plenty of activities for children of all ages and provides a wealth of interesting facts and trivia. The main building includes an OMNIMAX that shows primarily science documentary material that can certainly be exhilarating if you’ve never been before, but is probably not going to be a regular spectacle for most film-goers. As part of special promotions with the big studios, occasional major releases are presented on the OMNIMAX and usually attract huge audiences. The Wehrenbergs have been operating theaters longer than any other family in America, beginning shortly after the St. Louis World’s Fair. They continue to hold their own against AMC in St. Louis with 145 screens across 10 locations. They are looked upon fondly by the natives, in spite of (or perhaps because of) their cheesy logo sequences. I certainly won’t discuss all of their branches, but I will talk about the original, which also happens to be my favorite. Ronnie’s 20 has the requisite overblown exterior and features an equally excessive interior that boasts an IMAX, a two-story arcade, a trailers-only theater screen actually built into the main hall and auxiliary concession areas in the east and west wings. Considering the percentage of arcade machines that are indefinitely in need of repair and the late-80’s sound effects coming from the remainder, the atmosphere late at night can sometimes reminds me of a haunted carnival, which I actually prefer compared to the raucous seething bustle during the early evening. Still, I feel mildly affectionate towards Ronnie’s and find it one of the more palatable options for blockbusters. The number of screens tends to mean there are plenty of options and enough room for a few riskier sleeper hits. Advanced screenings are often times hosted here, but be sure to show up very early. You can depend on plenty of parking in the vast lot and several economical dinner choices nearby (I recommend the “Eat Rite” diner). I’ve never been a huge AMC fan (I grew up not far from a ridiculous AMC 30 in Kansas that had its own zipcode just for screens showing “Kangaroo Jack”), but the Esquire really is the bottom of the barrel. I used to go here frequently in college since it was the absolute closest to my dorm, but I can rarely remember having a pleasant experience. The ticket lines are long and slow, the building packed and filthy and the movie selection confined to the most odious studio excretions. The main central screen, however, is at least impressive for its gigantic stadium seating that seems to attract catcallers of all ages and opinions, leading to an obnoxiously “interactive” and distracting viewing experience. Let me set the scene: small children go crawling around between the rows scavenging for scraps, under-aged teens fornicate in the darkest recesses, local gangs wage knife-fights in the aisles, deranged drifters laugh, cry and boo at all the wrong times and old hobos with nowhere else to go snore loudly in the pockets of rotting popcorn too foul for the looters and muggers to approach. Well, maybe it’s not quite that bad, but you get the picture. Not too many people make it far enough Southeast in St. Louis to visit this somewhat rundown dollar theater, but it’s one of the few places to catch cheap second-run showings and I’m already coming to appreciate it. Situated atop an unexpected hill, it can be surprisingly difficult to find and access, but it does big business with the lower-quadrant genre and kiddy fodder. These are films that are being discussed whenever you hear someone saying “I might be interested, but not at full ticket price.” Unfortunately, much of the prospective audience continues to discuss the film even after they’ve reached their seats, so skip the family films if you can’t stand a talkative crowd. The architecture is extremely basic and practical, with the atrium and corridors a little too large such that on slow days you can hear the echoes and feel the emptiness. I would recommend the building go through some renovations and repairs, but that might ruin something of the low-budget charm. Note that despite being referred to as a “dollar theater” admittance is actually closer to $3-5 and don’t go hoping that the food will be discounted. So it’s not technically in St. Louis or even in Missouri, but the Skyview is the closest drive-in to the city and is just barely within practical distance for novelty and nostalgia seekers. You might not remember the tickets costing so much, but the low-fi portable speakers and incessant mosquitoes might ring a bell. The experience is a lot of fun with a large group of friends, but it can be exasperatingly difficult to find anything worth seeing. Skyview has a reputation for arranging double features that don’t take into account taste or run time (the last time I was there the dual flops ran well over 4 hours). When the weather, the quality of the movies, and the schedules of your cadre all align, this can be worth a try. Interesting choice of topic. I believe we went to that Tivoli in order to see the Labyrinth remastering, yes? And though you may hate the AMC 30, I happen to think that the Westglen is the absolute worst theater I've ever been to in town. I can't remember a screening I've went to there that wasn't botched in some awful way. Yup, that was the Tivoli we saw Labyrinth at. They show a lot of cool stuff that appeals to our 80's youth, but also plenty of other midnight specials. And don't get me wrong, I completely agree that Westglen ranks below AMC 30. The Esquire 7 is sort of my St. Louis Westglen, but with less junior high kids chattering about and hooking up (a Westglen specialty). Still, I have lots of good memories about spending time with friends where Westglen is part of the backdrop, so it has that nostalgia tinge. I would like to point out that you have also been to the Des Peres 14 (so tragically unhip that it is populated only by 13 year olds waiting for rides from their parents -- I myself went there often in middle school) and the West Olive 16 when we were in west county. The Chesterfield Galaxy (14) also has an iMax, which I suppose is cool for people who are into that sort of thing. P.S. Isn't it brown 100? Very comprehensive and accurate, I'd say. I definitely had some horrible experiences at the Esquire (which I am stretching to include the time I almost got run over in the parking lot), but, in its defense (or rather as a guide for any Wash U student going for the closest option), I found that matinees were generally empty enough to be acceptable, and if you wait long enough for something to be in one of the tiny upstairs theaters even evening shows can be okay. Plus, you get to experience the top half of the odd, vertically split theaters with balconies but no floor seating, of which I was always rather fond. Yeah, I did enjoy the upper screens. I watched Corpse Bride up there and it was actually a neat arrangement. Good call! Hi there. Thanks for your write up on all the St. Louis Theatres! I know you wrote this a year ago, but I hope you still check out your comments. I still have yet to check out the Moolah and Skyview Drive-In. I did want to let you know that I'm running Late Nite shows (11:30p to Midnight) at the Hi-Pointe every month showcasing horror and films of the fantasique! Hi-Pointe Theatre recently expaned their screen size and will soon have digital projection - even though I'm a 35mm fan myself. Next month on June 25th & 26th, I'm showing Lucio Fulci's THE BEYOND at 11:30pm at Hi-Pointe if you want to stop by! Thanks for the comment. I didn't know about the upgraded screen size, which sounds like a good thing even with the switch to digital. I haven't been by in a while, but I'll definitely try and make it to one of your late nite screenings. The Beyond is a classic, or at least a classic of Italian horror and eye-gouging. Do you have a website or calendar or something that can keep me posted on the monthly films? Btw, are you Andy from the "Destroy the Brain!" podcasts? Yes, I am Andy from the DESTROY THE BRAIN! Podcasts. DESTROY THE BRAIN! is now a full fledged site with news, reviews and more. It just unleashed last month, so I'm still building content. If you go to the site (http://www.destroythebrainonline.com), you can click on the LATE NITE GRINDHOUSE link in the menubar to always give you the next show.